As well as the numerous cascades on every stream, the three main rivers of Endau-Rompin national park each have their awe m agnificent waterfall. 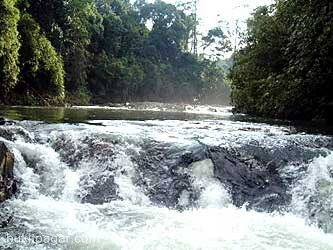 Undoubtedly the jewel of the park is the awe inspiring Buaya Sangkut waterfall on the Jasin river. (The Orang Asli believes that whoever wash their eyes of Buaya Sangkut will never go blind). These 40 meters wide and 120 meters high fall are the reward of hours of trekking, and challenging climb to the top reveals breathtaking views over the canopy of the surrounding jungle. It is best to contact your travel agent for guided tours of Endau-Rompin, as the area is largely underdeveloped and infrastructure is minimal. Entry permits are a must and visitors will have to provide two passport sized photographs and a photocopy of their identity card or passport. 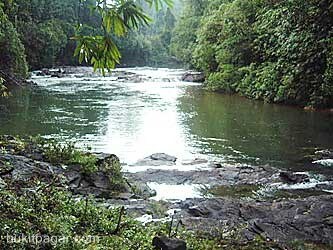 Endau-Rompin is accessible by road from KL and Singapore but it is advisable to use 4WD. It takes 5 hours from KL. Your travel agent will be able to provide further details as to the itinerary of your tour. 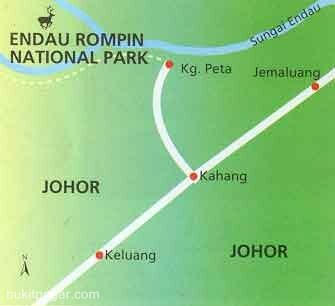 The tour will typically include all meals, accommodation, and transport to and from Endau-Rompin, as well as transport within the park.